Spinal health in the palm of your hand. The VDP-PRO, an instrument like no other. The only known instrument that can relieve Facet Syndrome and Disc Lesions from C2 to the sacrum. When you add the VDP-PRO to your technique arsenal, serve your patients like never before and enjoy more well-deserved referrals. Put the adjusting power of Flexion-Distraction in the palm of your hand with the new VDP-PRO! The Patented and FDA Registered VDP-PRO is an instrument like none other in healthcare — a revolutionary instrument made of strong but light-weight die-cast aluminum, nylon and steel. You can quickly and easily accomplish many things your patients need, depending on your goals. You can use it on the spine to reduce IVD herniations, replenish nutrients to the IVD’s or even relieve facet syndrome. You can also use it as an IASTM tool to simply and effectively stretch and release myofascial adhesions in just about any region of the body. Patients love it and you will too. Give your fingers a break and let the VDP-PRO do the work! how to use it properly. We have put the VDP into hundreds of practitioners’ hands who have used it successfully. The new VDP-PRO is fully upgraded with enhanced functionality. See here what practitioners have found. The VDP-PRO delivers fast results and relief; it motivates your patients to refer you to their friends and family. Check out what practitioners and patients are saying about this new innovative instrument. all the way from C2 to the sacrum. 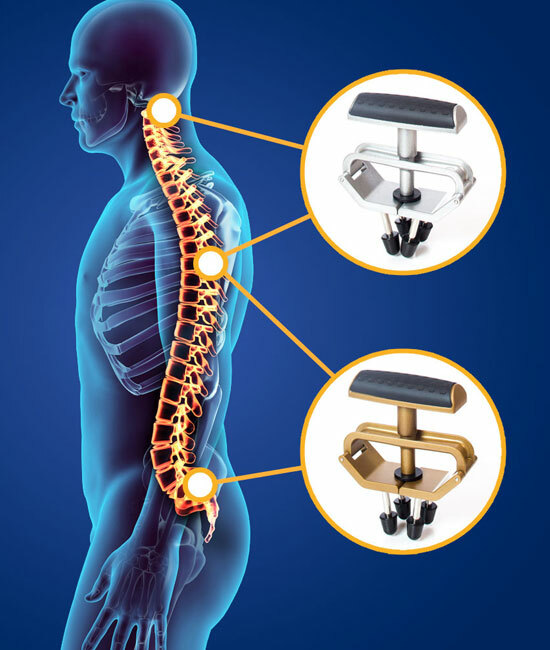 Like nothing else, the VDP-PRO instruments incorporate the well-researched and effective flexion-distraction technique at all spinal levels. They eliminate the need for awkward, hard to master, and expensive tables and machines. The provider can easily apply a very specifically targeted spinal distraction force. It can often take less than a minute to apply and deliver significant relief. Anyone with a subluxation or related spinal condition who is a good candidate for adjusting with the flexion-distraction technique is a great candidate for using the VDP-PRO. This can include anyone who you believe would benefit from conservative care, including those dealing with the most common issues and sources of pain and dysfunction: myofascitis, disc compression, disc degeneration, disc herniation and facet syndrome. When applied to a patient with a herniated disc, the VDP-PRO works by creating a 2-3 millimeter distraction of the facet joints and posterior disc space, which creates a centripetal, or towards the middle effect within the nucleus pulposis. This centripetal force is what draws, or “pumps” the herniated portion of the disc back to its normal anatomical position. When applied to a patient with intervertebral disc degeneration, the VDP-PRO can help replenish the disc. It works by “pumping” the annulus and nucleus pulposis, and promoting the natural imbibition of hydration and nutrients and the normal release of waste products. When applied to patients with facet syndrome, the VDP-PRO works by relieving the facet joint imbrications and pressure, and releasing fibrotic adhesions around the joints to help them move and function more normally. The bullet-nose-shaped rubber tips on the VDP-PRO penetrate deep into the tissue, including the often tough myofascia. This allows them to efficiently “grasp” the soft-tissue and not slip as they are separated. The provider can easily achieve the desired distraction force to ultimately release any tight tissue, open-up the facet joints and decompress the disc spaces. Providers have reported numerous cases where disc herniations have been clinically reduced with a single application of the VDP-PRO. Check out this video for more information about the features of the upgraded VDP-PRO and how it compares to the original VDP instrument. Many providers and patients around the world proclaim how remarkably the VDP instruments work! They empower the provider to simply and easily flex and distract virtually all disc levels in the spine, and help relieve some of the most difficult to adjust and manage spinal subluxation degeneration issues that make life miserable for too many people.